I was recently prompted to think about what sustainability means to me. Two aspects immediately came to mind – thriving people and planet. Sustainability and sustainable development are hardly new concepts. The most commonly cited definition for sustainable development dates back to 1987 (in fact I quoted it in my very first blog post almost four years ago). This definition includes the concepts of intra-generational equity (i.e. ensuring fairness between people of the same generation) and inter-generational equity (i.e. ensuring fairness between the current generation and the next and the next and so on). This definition is broad and vague enough that it has been quite widely accepted. 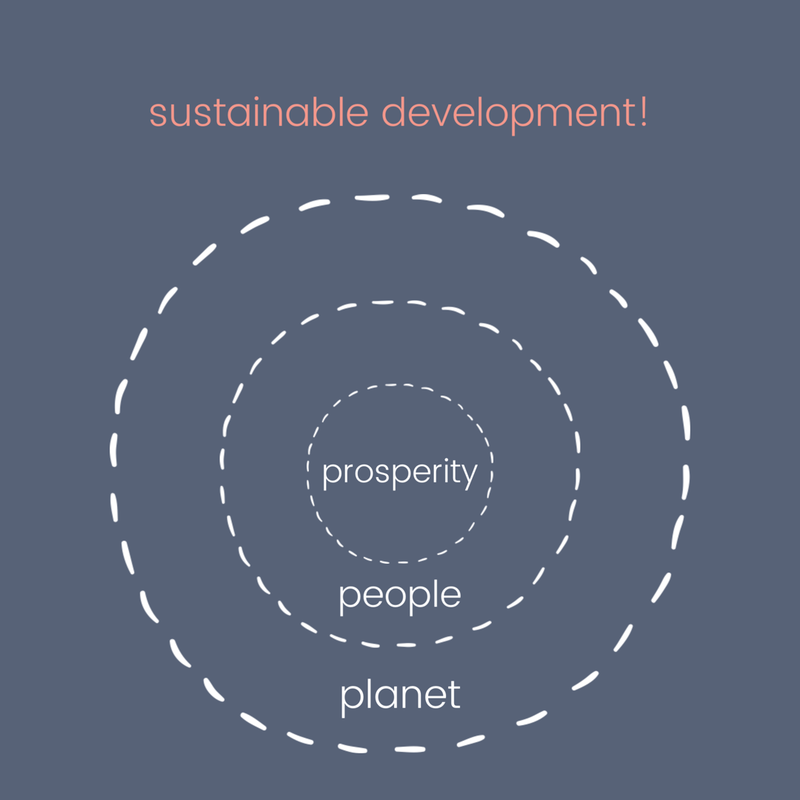 As far back as the nineties, the economic, social and environmental systems have been recognised as the three pillars of sustainable development. More recently the terms ‘prosperity’, ‘people’ and ‘planet’ have been used instead (because everyone loves alliteration!). These systems are sometimes represented as overlapping circles and the intersection is the point where sustainable development occurs. 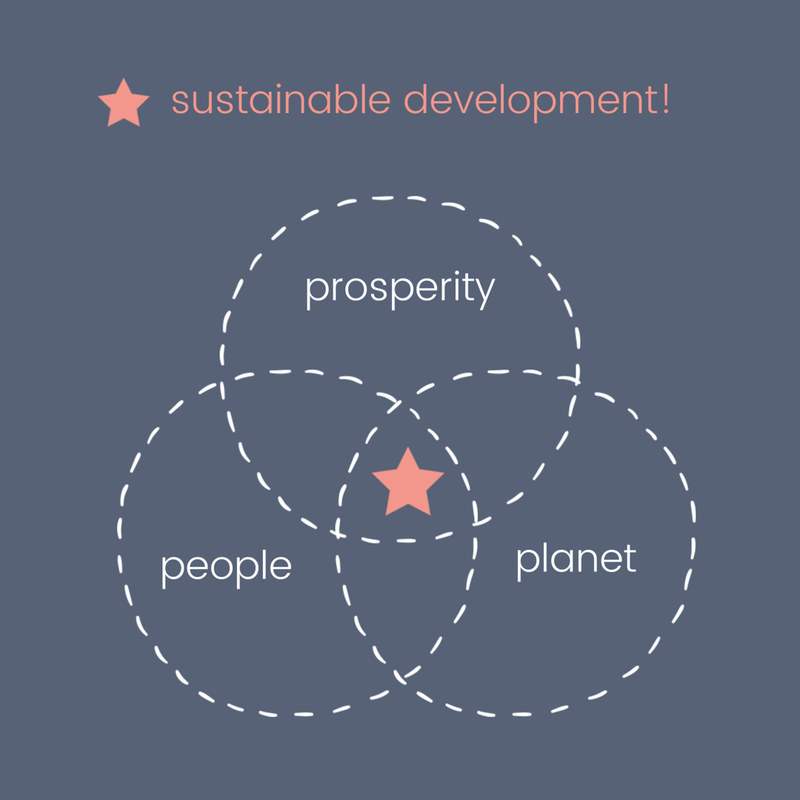 Another common way to visualise the three pillars of sustainability is as nested systems. The diagram above shows the people, planet and prosperity circles as three separate elements that sometimes overlap, but in fact they are entirely interdependent. This is shown in the diagram below. The planet is the largest circle, as it supports everything else – there would be no people if we didn’t have a planet to live on! And prosperity sits entirely within the people circle. It is one thing that people need, but certainly not the only thing. the ecological ceiling (shown as the outer circle) – defined as the planetary boundaries identified by the Stockholm Resilience Centre. These boundaries define the limits within which people can safely and happily live in harmony with the planet. More than the two earlier concepts I presented above, the doughnut resonates with me because the focus entirely on creating a space in which people and the planet can thrive. The current sustainable development agenda adopted by the nations of the UN comprises 17 sustainable development goals (SDGs). Adopted in 2015, these goals are aimed at supporting the ‘five Ps’ – people, planet, prosperity, peace, and partnership. 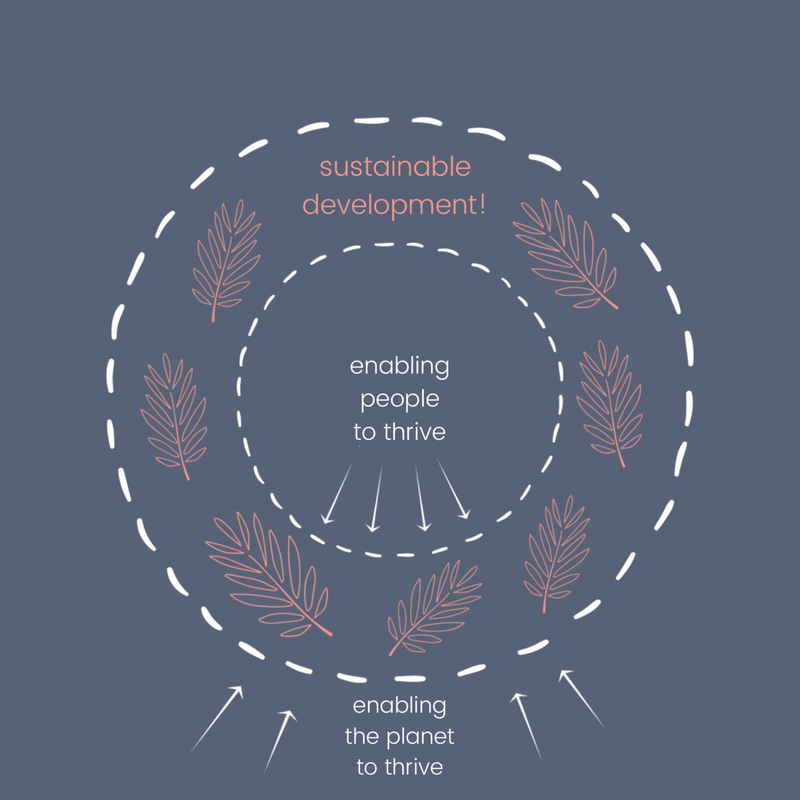 …“sustainable development” means the process of improving the economic, social, environmental and cultural well-being of Wales by taking action, in accordance with the sustainable development principle, aimed at achieving the well-being goals. The Welsh definition adds cultural sustainability into the mix, which is something I’d like to explore more on the blog (watch this space!). Other definitions and frameworks for sustainability also mention other concepts like politics and governance as the fourth pillar of sustainability. However I feel like all these elements – culture, politics, governance, prosperity, peace and partnership – could be grouped together under ‘people’. These are all essential elements for creating a society that enables people to thrive (noting also that strong governance and progressive politics can support positive environmental outcomes). Are just ‘two Ps’ enough? So after a bit of a journey through the history and theory of sustainability and sustainable development, I think I ended up back where I started with this reflection. Thriving people and thriving planet. I see the aim of sustainable development as enabling these things to happen now and in the future. It’s pretty easy to say, but a lot harder to make happen!